As the shock, anger and grief from the Sandy Hook Elementary tragedy fades, each of us contends, knowingly or not, with a portal moment: What now? In which direction, God, am I to move as a person of faith? 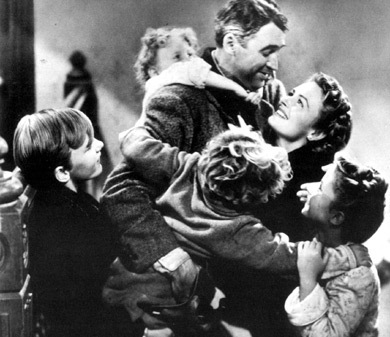 Being George Bailey: Through faith, sacrifice, struggle and courage, he helped create a world that ought to be. Will people of faith do the same after Sandy Hook Elementary? Portal moments are those profound events that possess and sometimes swamp our souls. They are unavoidable, ground-zero incidents that represent a larger truth and reality. They can be glorious affairs, like a decision to be baptized, or the awe you felt when you first saw a human footprint on the moon’s powdery surface. They can also be deeply painful and disturbing, like cancer in a beloved one, and like the violent and evil taking of innocent life: an entire first grade class of innocent life. Painful or glorious, they represent the weightier and demanding matters of life, and even when glorious they are rarely entirely peaceful. They provoke us from our comfortable slumbers to acknowledge deeper and sometimes darker realities, and ideally spur us to partake in the good works God prepared in advance for us to do as part of his workmanship [Eph 2:10]. It takes courage and faith to walk through such portals, which usually last between two to seven days. As a nation, we are nearing the end of the time that people will do more than talk. They will act—or not. Tomorrow is an unofficial but still real deadline. Many do not heed their call because they remind us with great clarity that we are needed. Not someone else—not our pastor, their spouse, our spouse, the White House—you, Mr. or Mrs. Flesh-n-Blood. The weight of our own importance tethered to God’s will for us is so mighty that some flinch away. We are needed because though God works in mysterious ways, his favorite and most common avenue is through His people. It’s a reality that frightens some because with it comes the twin sons of responsibility and duty. So we offload them through convenient trickery. One is to become even more falsely religious or spiritual. We partake in magical prayers to God to bind all evil on Earth. These Cosmic Bell-Hop prayers dominate Facebook, and are sadly a behavior that has more to do with superstition than genuine petition. Worse, such naive prayers are judged as satisfactory. They give the impression of action, yet they keep a person firmly planted on the comfort-giving sidelines of life. That’s not an accident. Such people hide their selfishness and cowardice behind an elaborate religious masquerade. They appear pious, but they are not life-donating because they partake in a religion of me, not us. For example, the rich Hebrew concept of Shalom that Timothy Keller rightly describes as the “way things ought to be,” is reduced by such people to merely personal peace. They turn the deep wine of Shalom into the insipid water of selfish individualism. Shalom means that we help to create beautiful Bedford Falls, not the slum of Pottersville, as witnessed in the Christmas classic, It’s a Wonderful Life. But their religion and soul remain too small for others, and even worse they carry with them a form of spiritual haughtiness—part of the sin that took Sodom down. “Behold, this was the guilt of your sister Sodom: she and her daughters had pride, excess of food, and prosperous ease, but did not aid the poor and needy. They were haughty and did an abomination before me. So I removed them when I saw it.” [Ezekial 16:49-50]. The way things ought to be is that all children should be able to go to school, youth group, Sunday School, kindergarten, summer camp and related places, and be free of violence, oppression, disdain, contempt, ridicule, condemnation, and all the other raw material that create bullying. They shouldn’t live in fear that targets or former targets of serial bullying will bring a gun to school and massacre innocents, which is what has happened in 85% of school shootings in America. Sandy Hook perpetrator Adam Lanza fits core parts of the school-shooter profile. Our upcoming faith-based program helps create such sanctuaries of goodness, hope and Shalom. We need your help completing it by December 31. To help rescue more children from this intentional but preventable form of abuse, click here: Hero in You Faith-Based Anti-Bullying Program. Will we succumb to the sin of Sodom after Sandy Hook? Here’s how to answer: What did your tears cause you to do after hearing about such evil? If they have not lead you to do something tangibly redemptive, then they are about releasing your own internal tension, not releasing the tension and pain of others. They are you-based, not us-based. Join us while we help bring life to others, and in the process, grow your own faith, character and stature. Our portal moment here at The Protectors has been to increase our efforts to become an even brighter star in the freedom-from-bullying movement, in what the YMCA, Dartmouth Medical School, and Institute for American Values calls “Authoritative Communities,” which calls for a stronger national connection to faith-based organizations that forge authentic relationships with today’s disintegrating youth culture (http://americanvalues.org/bookstore/pub.php?pub=17#.UNDBCqU1b8s). We continue to blaze new ground with our unique mission to both public schools and private faith-based organizations. Part of this new ground is our upcoming, Hero in You Faith-Based Anti-Bullying Program. It is the only solution of its kind in the nation, and as far as we know, the world. We can’t complete it and make it available without your help. So with only 13 days left to bring God’s love, mercy and compassion to children throughout the world, we ask that you act now because the portal is nearly closed. The reality is that more children will escape the torment of bullying with your help. Because more violent tragedies are coming. Youth culture is too broken and the abuse of bullying too prevalent to conclude otherwise. We have many sins to make amends for. It’s well past time for more people of faith to do what George Bailey did and sacrifice to help make our community a better place as a tangible expression of our service to God and love and devotion to His Son. Hero in You Faith-Based Anti-Bullying Program.